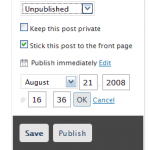 With WordPress 2.7 you are able to make a post sticky, so this particular post will be showed on the top always. Before that you had to use a Plugin. 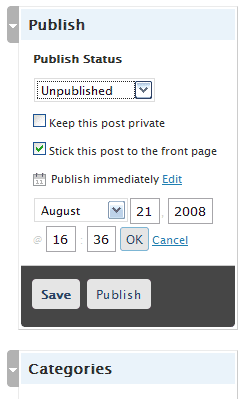 You can activate this setting for a post in the publish area, where you edit the publish date. It's pretty easy to do. But what, if you like to format the sticky post? For this matter there is a new function - post_class(). This gives classes for the different posts, also the class sticky, if it's a sticky post. Additionally are classes for categories and tags available. An example here with some information. So what is WPlize and what is it for? WPlize is a class, which access the options table of WordPress and makes it easier to create, edit, get and delete preferences of a Plugin or theme in the options table of WordPress. Using this class improves the performances and create a clean code in Plugins and themes. Only one entry will be created for each Plugin or theme, an array creates and manages the entries. In this example I'm talking about how to display a specific company slogan in a certain color. This slogan is found in the header and content. It looks like showing total amount of posts, pages and some other statistical values are very popular right now. I received many inquiries how to show statistical values on your front end. Following solution only works with WordPress 2.5 or higher. If you need help for a lower version, let me know in the comment field and I'll try to help.